As part of its strategy to encourage the consumption of local produce, the Marketing and National Importing Board will be staging a Pumpkin Festival on Friday, 19 December, on the compound of its River Road pack house. Business Development Manager – Roderick St Clair said that the initiative is a promotional drive aimed at increasing the consumption of pumpkin especially at a time when it’s in abundance. “The occasion will be used to display various cuisines that can be prepared using pumpkin,” said St Clair. “There will be traditional preparations such as soup, pies and steam and then there will be a lot of innovative and creative ways to use the pumpkin when preparing meals, snacks and drinks,” he explained. “The whole idea is for the Grenadian public to eat pumpkin and make it become a main stable on the food table, it’s a healthy food and our focus at MNIB is increasing the healthy consumption of local produce,” he added. 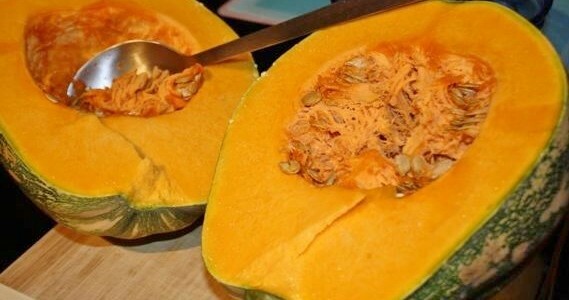 Pumpkin is one of the food items recommended by dietitians in cholesterol controlling and weight reduction programs. It’s described as a storehouse of many anti-oxidant vitamins such as Vitamin A, C, and E. It is also a good source of B–complex group of vitamins like folates, niacin, Vitamin B–6 (pyridoxine), thiamin, pantothenic acid, and an excellent source of many natural poly-phenolic flavonoid compounds. “With all these healthy qualities of pumpkin we want Grenadians to start accepting pumpkin as a main staple for the plate, treat it like a must-have when shopping for fruits and vegetables,” said St Clair. The Festival will start at 7 am with a special pumpkin breakfast, and concludes at 6 pm. This is the second produce-specific type festival aimed at informally educating the general population about the health benefits and various ways the produce can be prepared; already the MNIB has organised a mango festival where products are displayed using mango.